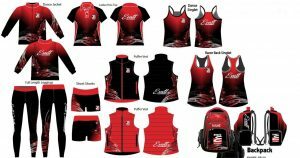 All competitors are required to purchase the Evatt Uniform as it is mandatory to wear at competitions. New Uniform 2018 – will be transitioned over 2-3 years. Please note there are 2 sizes of backpack (refer order form) and the Polo Shirts come in Men’s sizes too. Content Copyright © 2013 Evatt Calisthenics Club.Website by Double-E Design.